On 20th February, Darjeeling Friendly XI welcomed the Abu Dhabi Gentlemen at the ICC Cricket Academy. The last few encounters between the two sides have seen the Abu Dhabi Gentlemen victorious & Darjeeling team wanted to make sure this was put to an end. The days play started off with the Darjeeling fielding team waiting for the batsmen, reviewing some sort of worm attacking some sort of wasp at short cover. For the non-biological-boffins, the cricket couldn’t start soon enough. Chris M, debutant opened the bowling & bowled very well. He picked up 2 wickets for 18, both caught. Ieuan caught an impressive catch running both back ward & side ward, much to his parents delight, watching on from the Pavilion. Greg Moses, Mr Darjeeling, star performer with the ball, bowled both economically & successfully, picking up 1 for 6 off 3 overs. Miller & Ash (Skip) were running late & joined the field for battle. The score was 24-3 off 7 overs, it was clear we were in for a low-scoring affair, with the pitch being slow with improbable bounce. David was first change & also kept the bowling very tight, returning with respective figures of 1 for 15 off his 4 overs. There was some hope for the Gentlemen with a partnership of nearly 30, between the opener aka ‘The Keeper’ scored a snail pace 22 (44 balls) & number 7 batsman ‘Shaun’ who managed 27 (off about the same number of balls). There were a flurry of boundaries, good shots by the batsmen off Brendan & Dex. When they both bowled a good line, the pitch did the rest of the talking. Dex was slightly baffled by a couple of caught & bowled opportunities, borderline lack of commitment off his own bowling. Ash was the impressive with the ball, figures of 3-25 off 3 overs. Brenden had figures of 0 – 21 off, Dex 0-18 off 2. The fielding was higher than the average Darjeeling display, one handed pick-ups on the boundaries, quick releases & a few dives for the audience, about 3 people in total. 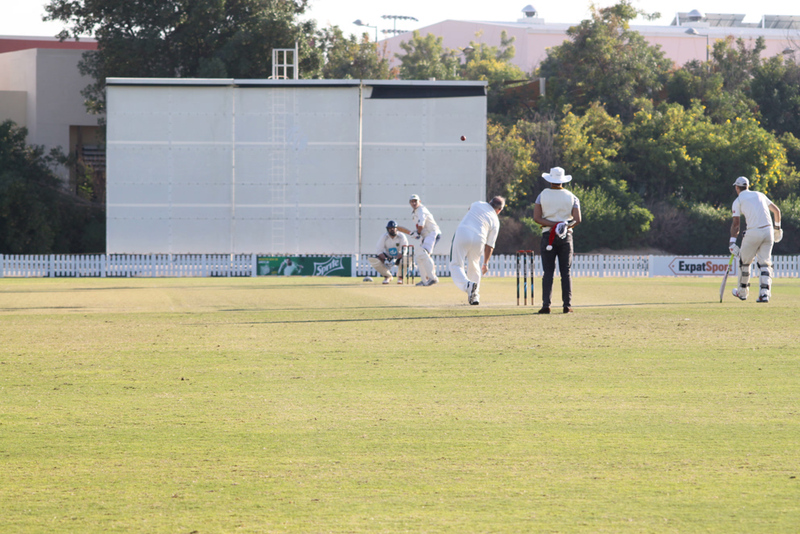 The Abu Dhabi Gentlemen ended up on 108 – 7 off their 20 overs. After a short break, the chase was on, Umer & Peter opened the batting. Peter was bowled by a leg spinner in the 2nd over, 2nd ball, Darjeeling 4 – 1. Paul, Chris & Grant all hit some nice shots, but none could make double figures on the difficult wicket. Paul with a slash pull, Chris with straight drives & Grant with a cover drive. Umer (The Original, not Malik), started off slow, held up an need & saw off the opening bowlers & started to gain momentum by hitting a pull shot, straight drive & slash outside off, fine of 3rd Man, all to the Keeper’s disappointment. He was out trying to cover drive off the back foot, caught mid-off diving forward. The score was 50 odd after 11 overs, Darjeeling behind the rate mainly due a lack of partnership. Greg managed 9 runs, out caught & Ieuan for a duck also caught. At one point Darjeeling required 60 runs off 42 balls. With Darjeeling looking at yet another defeat against Abu Dhabi, Brenden, the silent assassin / ninja decided it was up to him to change the outcome of the result. Dex well supported for the much needed partnership, Brenden hit a masterful array of shots hitting one of the bowlers for about 26 runs. The pick of the shots were a pull for 6 & straight drive for 6. With the job still not finished Dex hit a couple of boundaries, Darjeeling needing 4 off the last 6 balls. Fittingly a boundary was smashed early into the last over, Darjeeling strangling the Abu Dhabi Gentlemen much like the worm & wasp from earlier in the day. A great win & a great all round team performance, onto the Canadians! This entry was posted in Cricket, Match Report and tagged Abu Dhabi Gents, Cricket Match, Darjeeling Cricket Club, ICC Academy. Bookmark the permalink.